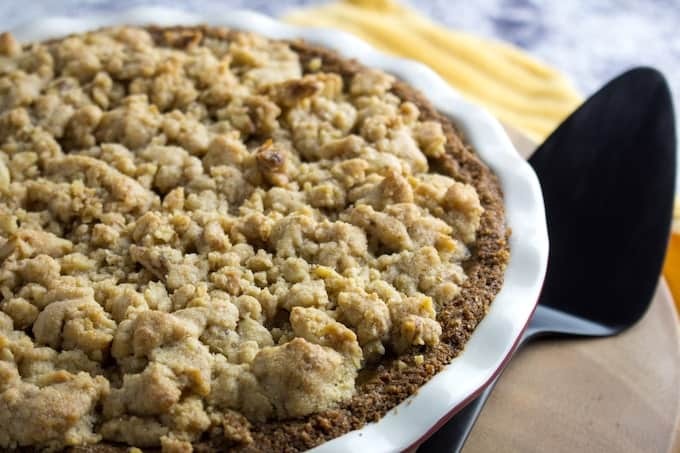 Homemade Pumpkin Pie & Streusel Topping is sweet pumpkin filling in a gluten free graham cracker crust topped with brown sugar and buttery streusel topping. It’s deceptively easy to make, but looks super fancy for your next holiday party! Since we’re all in a pumpkin pie spiced kind of mood today, check out my Pumpkin Pie Smoothie, Gluten Free Pumpkin Bread, Easy Pumpkin Pie Dip, and Pumpkin Spiced Rice Krispie Treats! It’s officially here. With October comes pumpkin spiced everything. I’m not complaining, honestly I love cooking with pumpkin! Not only is pumpkin both delicious and nostalgic, but it also helps out a lot with the texture of gluten free baked goods. Homemade Pumpkin Pie & Streusel Topping is just what I needed to ring in the national holiday (Pumpkin Spice Season is a national holiday, isn’t it?). 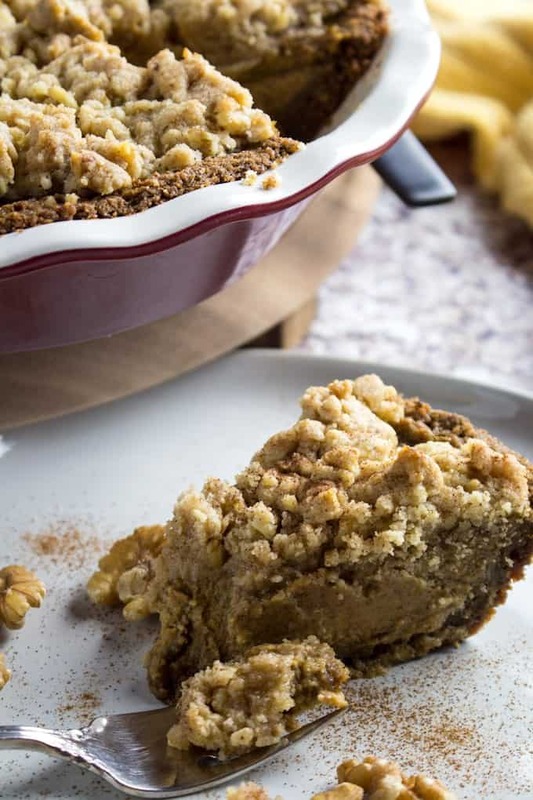 It’s sweet mixed with cinnamon, ginger, and nutmeg in a graham cracker crust then topped with a flakey, buttery, brown sugary streusel topping. I promise you that everyone will be asking for this recipe! As a bonus, it’s also gluten free. Shhh… nobody will know if you don’t mention it! How do you make homemade pumpkin pie? Homemade pumpkin pie only requires a few simple steps. 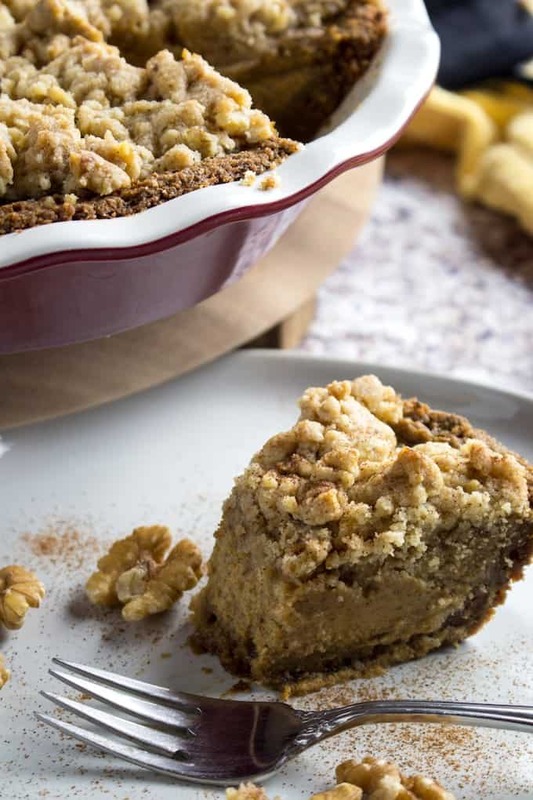 You won’t believe how easy it is to make, including the streusel topping! Prepare your gluten free graham cracker crust (you can use a regular graham cracker crust if you’re not making a gluten free pumpkin pie). I go into a lot of detail about that in this post. But I’ve included the link to the recipe below as well, for easy referencing. In a bowl, combine your wet ingredients for the pumpkin pie filling, whisking until well combined. Then pour it into the pie shell and bake until it almost sets. Pulse streusel toppings in the food processor until combined. 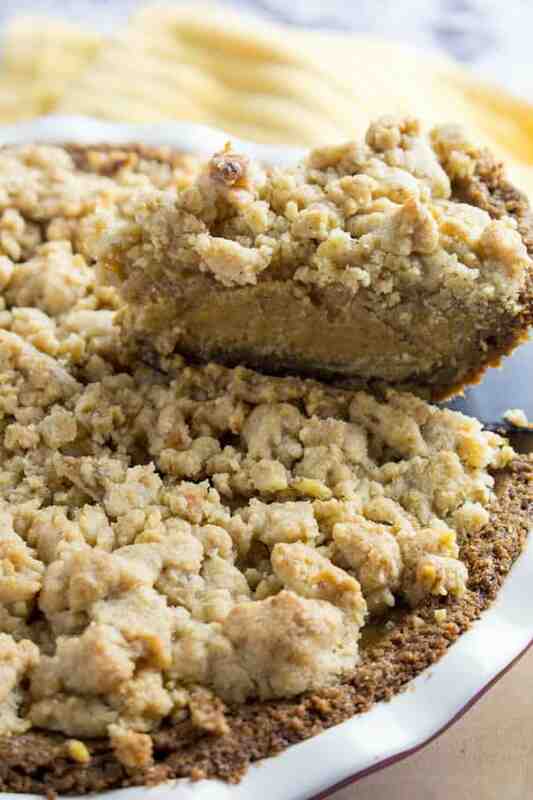 Pull the pie out of the oven carefully, and top it with the streusel. Put the pie back in the oven for the remaining time to finish. That is it! Homemade pumpkin pie is super simple, the hardest part is mixing all of the ingredient together, and timing when to add the streusel. But it’s pretty forgiving, as long as you don’t go the entire time before adding the topping, you’ll be fine. If you want to make pumpkin pie from scratch using your own pumpkin, you’ll need to add a few more steps in here. I’m working on a post about how to make your own pumpkin pie filling, so stay tuned! Technically you don’t have to. I usually do, because I like to make homemade graham cracker crust for my pumpkin streusel pies. Baking a graham cracker crust before adding the pie filling helps hold it together and makes it easier to lift the pie pieces out when you’re ready to serve it. You also need to take into account that the pumpkin pie filling has a lot of moisture, so your crust won’t have a chance to get toasty when the pie is baking, and you’ll end up with something that’s soggy on the bottom. It only takes about 5-10 minutes to bake the crust first, so I’d recommend not skipping this step. 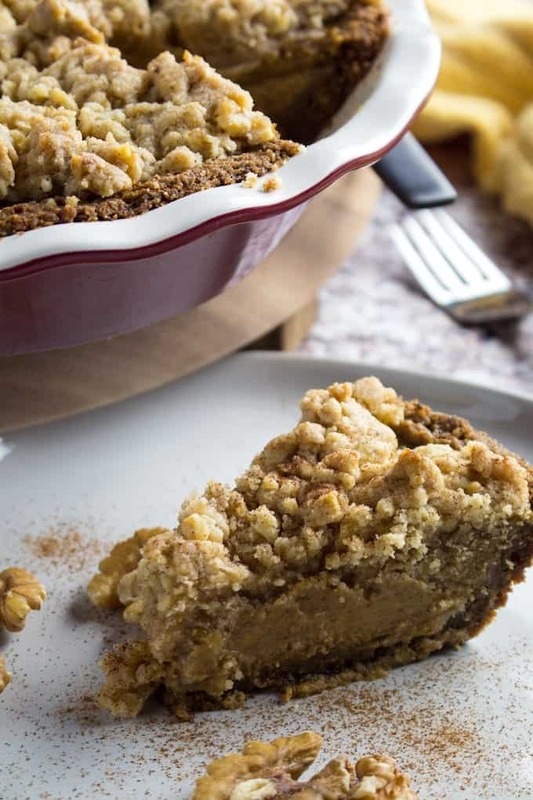 How long do you bake pumpkin streusel pie? The pumpkin pie from scratch in this recipe takes about 60 minutes to bake. Remember, you need to add the streusel topping half way through, so only set your oven timer for a little over half of the time (about 35-40 minutes). Then add the topping, and set your timer for the remaining amount of time. Your pumpkin streusel pie should be golden brown and ready to go by the end. How many cups of pumpkin do you need for a gluten free pumpkin pie? I still count this as a pumpkin pie from scratch when I’m using the canned pumpkin. Mostly because the pie itself is not store-bought, and that’s a triumph in my book. However, if you really want to make a traditional pumpkin pie from scratch, you can cut up your own pumpkin and everything. When I make gluten free pumpkin pie, I use one whole can of pumpkin, which is about 2 cups. If you want to make your own pumpkin pie from scratch, using a real pumpkin, you should start with a 3 or 4 lb pumpkin. I recommend using a sugar pumpkin, because you will get a better texture for your pie filling. But you may have some pumpkin puree left over. You can freeze it and use it for next time, or use it to make another gluten free pumpkin pie, or even a recipe like my Pumpkin Pie Cheesecake! How long should a pie cool before cutting? 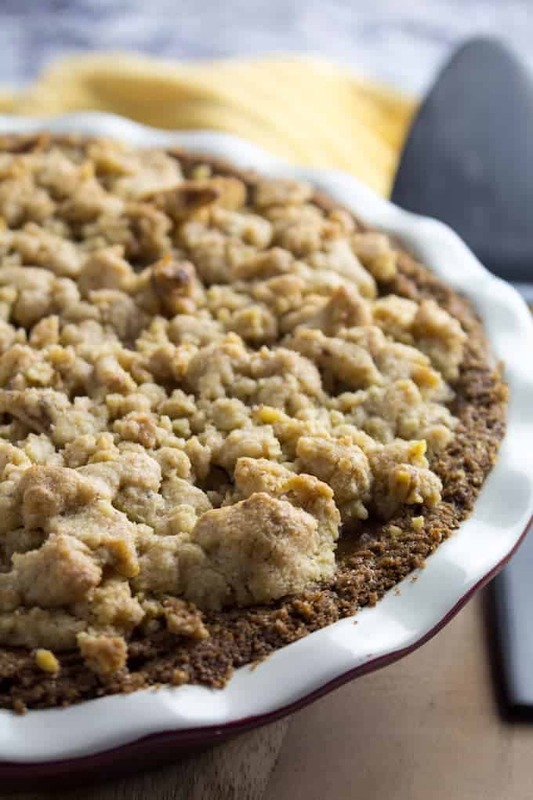 I like to cool this pumpkin streusel pie completely before cutting into it. Especially pies that use a custard like pumpkin pie, because you’re going to pull this out of the oven before it’s officially set. The heat from the pie will finish cooking it once it’s out of the oven. If you wait until it’s completely set (hard) while it’s still cooking, you’ll end up with a pumpkin streusel pie that’s a bit overcooked and cracked. It’s hard to see this with the streusel topping, which is why we need to follow the timing closely, and be quick when you add the topping half way through. What’s in pumpkin pie spice? 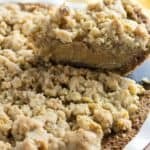 Homemade Pumpkin Pie & Streusel Topping is sweet pumpkin filling in a gluten free graham cracker crust topped with brown sugar and buttery streusel topping. It's deceptively easy to make, but looks super fancy for your next holiday party! Preheat oven to 350F. Prepare graham cracker crust according to instructions (link in ingredients). In a mixing bowl whisk together all of the pie filling ingredients until well combined. Pour into pie crust and bake 35-40 minutes. When there's about 10 minutes left in the baking time, add gluten free flour, pecans, and light brown sugar to food processor. Add butter in cut up pieces. Pulse until ingredients look like crumbs. Pull pie out of the oven carefully. Top evenly with streusel, and return to oven. Bake an additional 15-20 minutes, or until streusel is golden brown.